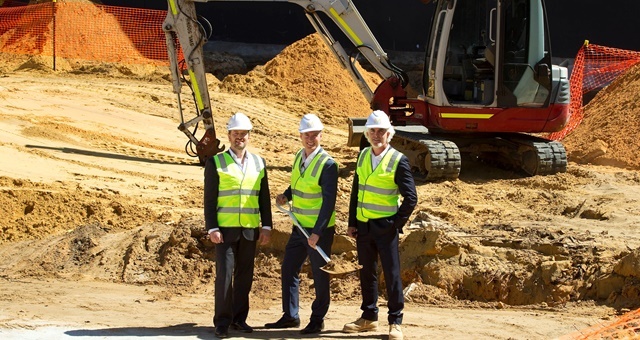 The newest of Quest Apartment Hotels’ pipeline has begun construction, with the first sods at the MGroup development being turned at Quest Joondalup in Western Australia. Once open from late 2019, the newest addition to the rapidly growing Quest map will feature 90 self-contained studio, one and two-bedroom apartments across five floors. An onsite fitness centre and business lounge will also be available to guests. Located at 65 Boas Avenue in Perth’s northern suburbs, Quest’s newest hotel apartments will feature in an area rapidly developing as an alternate CBD to the city, already home to the major Lakeside Joondalup Shopping Centre, Edith Cowan University and a key health campus. The growing area is home to over 13,000 businesses and 160,000 residents, with the population tipped to swell by nearly 10% before the year 2036. On hand to assist in the ceremonial sod turn was Joondalup City Mayor Albert Jacob, who said the city’s new Quest would enhance the region’s vitality and underline it as a key growth corridor in Northern Perth. He was joined by Quest General Manager – Growth, James Shields, who said the new property would drive traffic, business development and new job opportunities for the local community.